3rd September, 2004. In this issue: Road Conditions, Plot Swap, August Site Stats, Trek Notes from the Flinders, Waypoints Linked to Trek Notes, Upload Your Waypoints and Rubbish Reminder. We've got a fab newsletter for you this fortnight with a Flinders Ranges theme. Not only have we got all the latest news and happenings on ExplorOz, we're running a one week newsletter special on selected Flinders Ranges maps/books to coincide with the launch of 4 new Flinders Trek Notes. Western 4WDriver Magazine - Spring 2004, 52nd Edition. Just released this week, we have the Spring edition of this popular mini-mag. If you're planning a trip anywhere in Western Australia this mini-mag has all the news on what's going on and where. See shop for list of specific contents of this quarter's magazine. Another great pictorial guide by popular photographer David Kirkland. It's our Flinders Ranges theme so get in quick for heavily discounted prices - one week only! The Flinders Ranges - An Adventurer's Guide book. This pack contains 2 items - our pick of the best map plus the best guide book of the Flinders Ranges. a saving of $7.70 compared to buying separately. Normally $7.95, this week only $7.16 - 10% off. Normally $27.45, this week only $24.71 - 10% off. Normally $16.95, this week only $15.26 - 10% off. With Spring now upon us, track conditions Australia-wide are fairly stable. 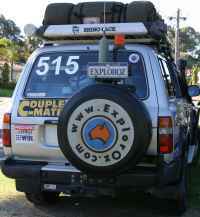 The ExplorOz Road Conditions is the only specific unsealed Australia-wide compilation of all reports from official sources (main roads, national parks, shire councils, VKS737). Although we don't claim to have the most accurate reports for a specific area at any moment in time, we do make a concerted effort to ensure the reports are no older than 1 week. Members are welcome to phone our office for more recent reports if required. Plot Swap currently has 143 plots available for sharing. Note - new members receive 200 free PointPlace credits for downloading plot files at time of joining. andthe number of pages viewed throughout the month has also shown a considerable increase (1,261,053). Click chart to find out more about our site stats. Unsubscribe or edit your profile - use the "MANAGE" link from the bottom of this newsletter. There are still another 2 stages left to developing how Trek Notes show GPS data, however this much has been completed and should certainly be a great help to your trip planning. To find which Treks have GPS data, go to the Trek Search page and look for the statement "contains digital mapping" (currently 22 treks have this feature active). Even if you haven't recorded plot files via OziExplorer, you might still have a whole lot of waypoints you've recorded on your GPS. Upload them into PointPlace™ and cross-reference them to a Trek Note. Our system will do the rest automatically. "burn it, don't bury it". dingoes will dig up human toilet wastes, so toilet paper inevitably will become strewn about the place after you leave. if the dingoes don't get to it first, wind erosion probably will. The generally accepted method of toileting is to dig a hole with a spade, do your business, and then drop the soiled toilet paper on top. Using a gas igniter or match, burn the toilet paper at the bottom of the hole and watch until it burns completely to ash and then cover with soil and pat down the earth firmly to cover all trace of your hole. (note - sanitary items and nappies should not be burned or buried. Seal in a plastic bag and carry to a central rubbish depot). See our Travel Etiquette page for more tips. Don't forget this Sunday is Father's Day - so to all those fathers out there we wish you a great day for spending quality time with the family!